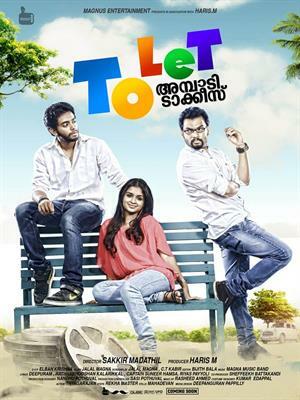 To Let Ambadi Talkies malayalam movie directed by debutante Zakeer Madathil featuring Arjun Askok, Sinil Zainudheen, Swarna Thomas and Devika in lead is gearing up for a grand release. Vijayaraghavan, Kalabhavan Shajon, Sivaji Guruvayoor, and Ambika Mohan will give life to other prominent characters in the movie. To Let Ambadi Talkies is being produced by Harris M under the banner of Magnus Entertainment. With a different theme and presentation, 'To Let Ambadi Talkies' is getting ready for release. Directed by debutante Zakeer Madathil, the movie is truly the celebration of the youth. The movie is themed around few youngsters who carry dreams to be active in the film field. They also wish to see the existence of the only cinema theatre which entertained the villages. Arjun Asokan, son of Harisree Asokan and Sinil Zainudheen, son of Zainudheen plays the lead characters who are deeply interested towards the glamour world. Manu (Arjun) and Antony (Sinil) are close friends. Manu is the son of Raghavan Nair who owned the only cinema talkies in the village while Antony is the son of Esthapan, a fisherman. Both youngsters had high expectations about cinema. Manu wished to become a filmmaker. Antony who had the skill to write stories had an ambition to script for movies. As the theatre was not profitable, Raghavan Nair decided to sell it off. Manu was totally against the action of his father. So Manu and Antony decided to shift their stay to the theatre and not letting Raghavan Nair to put it up for sale. Later the movie takes a lift with more interesting incidents happening which forms the crux of the story. The beauty of the movie enhances with appearance of Swarna Thomas who is now a busy actress in malayalam film industry. Harisree Asokan, Mukesh, Vijayaraghavan, Kalabhavan Shajon, Nadirsha Sivaji Guruvayoor, Devika and Ambika Mohan will also be seen in prominent roles. To Let Ambadi Talkies is being produced by Harris M under the banner of Magnus Entertainment. Scripted by Jalal Magnus and C T Kabir, Elban Krishna wields the camera while the tunes are set by Magnus Band for the lyrics of Captain Suneer Hamsa. To Let Ambadi Talkies would also be a gifted opportunity for Arjun Asokan, Sinil Zainudheen and Swarna Thomas who aspire to create their own space in the malayalm film industry. As the post productions are over, the movie would reach theatres by the end of May.